← Our Greatest Mother Shridevi Kundalini: She is both Mahamaya and Mahadevi ! Lord Shri Krishna Showing his Infinite Form to Arjuna on the Battle Ground! The topic is very interesting and equally controversial, right? Let us understand it clearly from a typical Upanishad way, i.e. a Reality Fiction. In this story, eternal truths are packaged in a contemporary fiction. Let us hear from the Horse’s Mouth, our great Realized Master Shri Sujnan Giri in a conversation with Jnana Hariputra, founder director of the International Institute of Sanskrit and Hinduism(IISH, pronounced Eesh ) at Hawaii, USA. We have not met him yet. Right? OK. Let us get introduced to him. His original name was John Harrison. Right from his childhood he was attracted to Hinduism and its spirituality. As he grew up, he studied Sanskrit in India in the traditional way. This gave him access to original truths present in our Great Scriptures such as Vedas, Upanishads, Agamas etc. While in India, he also got exposed to teachings of various Great Masters in Non-dualistic philosophy(Advaita Vedanta) established by our Great Master Shri Shankara Bhagavatpadah. In order to share the treasure of this great Indian knowledge, he established International Institute of Sanskrit and Hinduism back home at Hawaii, US. He was a staunch devotee of Narayana(Lord Vishnu), the omnipotent deity as mentioned in our Vedic hymn Narayana Sukta. To indicate his strong devotion towards Narayana, he changed his name to Jnana Hariputra(means the eternal knowledge born out of Lord Vishnu). Every year he used to visit India to see some holy place and to meet some Great Indian Master. After hearing about Shri Sujnan Giri, he decided to meet him to clarify his understanding of concepts of Hinduism. The following is the conversation of Hariputra with the Great Master Shri Sujnan Giri. After a formal introduction, Shri Sujnan Giri starts the discussion. Shri Sujnan Giri: “You answered your own question now 🙂 Let me explain. As we know, everybody is different in the universe. So, the nature, taste, likes, dislikes also vary from person to person. Our Sanatana Dharma(a.k.a Hinduism) presents a menu of millions of deities to suit specific nature of an individual, just like a restaurant does. Some devotees like a peaceful deity like Lakshmi, some others like a fierce form of Shridevi, viz. Kali, wearing a garland of heads. Some connoisseurs of beauty would like to worship Shridevi as Lalita Mahatripura Sundari(Supremely beautiful Goddess). Many others want to adore luxurious and magnificent Lord Vishnu. But, some others are more pleased with simple Lord Shiva sitting and meditating on the Himalayas! If you love animals, we have some deities with animal heads too. e.g. elephant-headed Lord Ganesha , Lion-headed Lord Narasimha(a Lord Vishnu’s form), Lord Karthikeya(worshiped as Divine serpent) and so on. Shri Sujnan Giri: “There are mainly two types of deities: principal and subsidiary. The principal deities are eternal and are not subjected to life cycle of the universe. In fact they control everything in the universe and beyond. 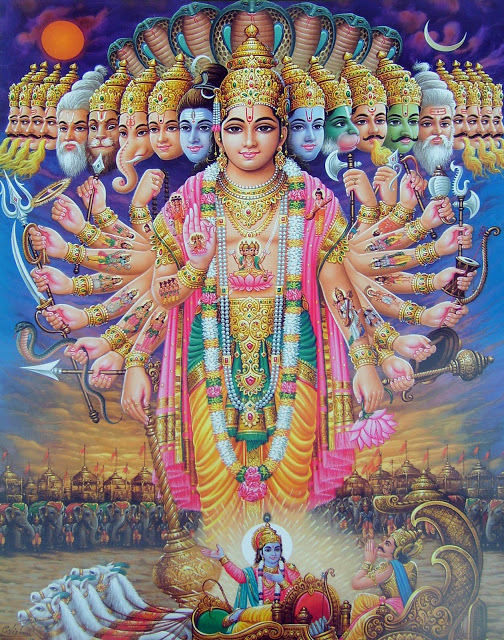 According to our Great Master Shri Shankara Bhagavatpadah, there are five principal Vedic deities, Lord Surya(the Sun God), Lord Ganesha, Shridevi Parvati, Lord Shiva and Lord Vishnu. Shri Sujnan Giri:“OK. It depends on your wish! You may pray subsidiary Gods to achieve specific material goals. e.g. you may worship Lord Kubera to accumulate wealth. These deities can also be the means to merge with the eternal principal deities which are nothing but the Universal Self. Shri Sujnan Giri: “OK. Let us take Shri Vishnu Sahasranama (1008 names of Lord Vishnu). You may be very surprised to hear this: many names of Lord Shiva that are in Shri Shiva Sahasranama( i.e. 1008 names of Lord Shiva) also appear in Shri Vishnu Sahasranama. e.g. Shri Sujnan Giri: “Of course. Greatest Sanskrit Poet Kalidasa wrote a famous shloka Vagarthaviva as the prayer in the beginning of his epic Raghuvamsha. One shloka addresses many deities giving more than 25 meanings! Shri Sujnan Giri: “This is a very good question, indeed. As discussed above, in Hinduism, every deity has been allocated to preside over a particular function. In other words, the administrative power is decentralized. For example, Lord Brahma creates the world, Lord Vishnu sustains it and finally Lord Shiva annihilates everything to himself. Lord Ganesha is in charge of obstacles. Shridevi Lakshmi is for prosperity and wealth. Shri Devi Saraswati is for learning. Lord Surya for health. Shridevi Parvati is for power. Lord Karthikeya presides over skills and creativity. The list goes on. Each deity has specific mantras and rituals of worship to propitiate it. Hariputra saluted the Great Master Shri Sujnana Giri and left. He understood. Thus, He understood. This entry was posted in Hindu Deities, Reality Fiction, Shri Sujnan Giri and tagged hinduism millions of gods, india millions of gods, why do hindus have so many deities, why do hindus worship many deities, why so many gods in hinduism, why there are many gods and goddesses in hinduism, why there are many gods in hinduism, why there are so many gods in hinduism. Bookmark the permalink. 4 Responses to Great Master Shri Sujnan Giri Explains: Why do we Worship Millions of Gods in Hinduism?